You are Link and Princess Zelda is asleep but you probably don’t know why because you were too busy humming along with the opening theme instead of reading the story and now you have to rescue her. Your objective is to return the crystals to the six palaces in order to bring together the three pieces of the Triforce and awaken Zelda. The year is 1988 (or the early 90s for me) and you are making your second journey into Hyrule only it is not the Hyrule you remember. The first thing you notice is that your perspective has changed. In addition you can jump now and crouch. You find that if you stay on the roads you won’t need to fight as much. The roads lead you to towns and you can interact with all sorts of townsfolk. In fact, you need to. You will be required to talk to townsfolk to get clues on where to go next and to learn new spells. Yeah, there is magic and you have levels too. Spoilers – You go through the cavern to the east of where you started and find yourself outside near the first Palace. If you are inquisitive you will undoubtedly head south along the water before going into the Palace and find yourself jumping from rocks to rocks dodging bubbles that are rising at you. You find a large heart that extends your life bar. When you finish there you enter the Palace. It’s something completely different to what you faced before. For one thing, there are elevators. There are skeletons, floating skulls and knights. You run around to find keys and open doors on your way to the boss battle. Some of what you see has some familiarity but you’ve never seen it like this before. Zelda II is my favorite game. I have many fond memories of playing it. And many others of watching my brother play it. I love everything about it: the music, the magic, the RPG elements, the towns, the people – everything. The year is 1988. This is a game unlike any you will play for the next 20 years. Enjoy it. Your name is Link and this is your adventure. 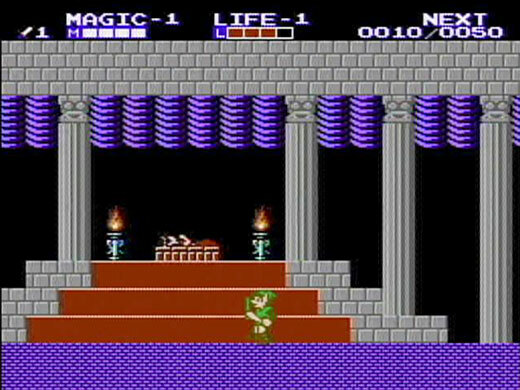 This entry was posted in Gaming and tagged Adventure, Link, Zelda II. Bookmark the permalink. Unfortunately, I have no memories of the game. I didn’t get to play it until I was 26, last year. It was difficult to pick up and play and I probably didn’t give it a fair shot. But, so many of my gaming friends have told me how great it is that I know it must be good. That is unfortunate. I can’t imagine growing up without Zelda II. I’m actually surprised that you have multiple friends that like the game. It seems to have a bad reputation and not many fans. Although I have seen multiple fans congregate in threads on boards like the Wii Lobby. That’s always surprising too.